Annie Mae Rankin Wisdom, age 89 of Mena, formerly of Nashville, went to be with her Lord and Savior on Friday, April 29, 2016 in Mena. She was born March 5, 1927 in the Roy community in Pike County, Arkansas to the late Henry Homer and Daisy Myrtle Stuart Rankin. She was a retired LPN and a homemaker. She was a member of the Pleasant Valley Baptist Church, an avid gardener and flower lover. Family was very important to her. Preceding her in death was her husband, Bro. Murrel Wisdom on February 12, 1974, and a sister; Martha Lou Rankin. Her survivors include; four children, Theresa and husband Devonne Breedlove of Ashdown, Twyla and husband Coyce Couch of Ozark, Wade and wife Paula Wisdom of Elkhart, Kansas, and Trudy Wisdom of New Port, Tennessee; one brother Dean Rankin of Murfreesboro; eight grandchildren; Sean Couch, Brad Breedlove, Shannon Naylor, Megan Franks, Emily Funston, Carrie Hernandez, Derek McNealy, Dalton McNealy; eleven great grandchildren and a large host of other family and friends. Services will be Monday, May 2,2016 at 2:00 p.m. at Nashville Funeral Home with Tim Franks, Dane Hernandez and Coyce Couch officiating. Interment will follow in Roy Cemetery. 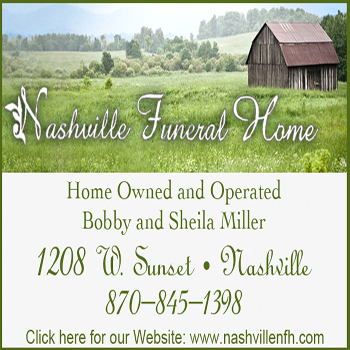 The family received friends at the funeral home on Sunday afternoon from 3:00 p.m. to 5:00 p.m. You may send the family an online sympathy message to www.nashvillefh.com. Memorials may be made to FeedTheChildren.org, or to the Texarkana Baptist Children’s Home, PO Box 611, Texarkana, Texas 75504.